It seems like we have more things in our home that are capable of taking pictures and videos now than ever before. Our phones, iPads, laptops, oh and our cameras & video cameras. We all use these devices, and my kids enjoy making movie clips, but they aren't always the best. By using the Online Christian Filmmakers Academy from Family Gravity Media, a division of Families For Christ Ministries, Inc. we have learned so much about making films and taking better pictures. Every summer Ken and Zach Lawrence host a Christian Filmmakers Camp in Colorado. It is a hands-on filmmaker training by industry professionals. Students are taught technical aspects of film making and how to use the equipment. The camp is limited to twelve students who want to learn more about cinematography, lighting, camera operating, directing, sound design and film score composing. They started the camp because they were frustrated with the training programs they were finding to attend themselves. None of them were hands-on and were given to large audiences that just sat in attendance. They contacted an instructor and he had other families that wanted a small hands-on class, so Ken invited them all to their conference center in CO and have held a camp every year since then. 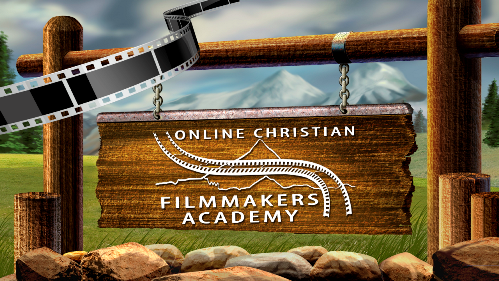 The Online Christian Filmmakers Academy was started so that the camp students could have more time for film making at camp if they already had the lecture portion before they came. They eventually opened it up to the general public. The Online Christian Filmmakers Academy is divided into five modules and covers everything you need to know about creating a film including information about the equipment, lighting, and production. Introduction~ This section includes instructions on using the program and Ken & Zach Lawrence introduce themselves. Module 2 Cinematography ~Fifteen lessons cover color temp, white balance, hard and soft light, types of light, lighting accessories, using lights, point lighting, painting with light, framing, outdoor light, depth of field, jibs and dollies, green screens, setting up an interview, final consideration, and a quiz. Module 3 Sound~ Sound equipment, microphones, field recorders, location recording, ADR and Folley are covered in six lessons and then there is a quiz. Module 4 Pre-Production~ Five lessons and a quiz cover the story, writing the screenplay, pre-production paper work, and assemble of the team. Module 5 Production~ The crew, set hierarchy, set etiquette, directing, the slate, and filming step-by-step are taught in six lessons followed by a quiz. The video lectures are given by Zach Lawrence. He explains everything you need to know and he demonstrates how the equipment is used and how everything works together. He also includes a lot of why things work or why you want to do it that way. Underneath the video you can ask questions relating to that particular lesson. Although we did not ask a questions other people using the program did ask questions and they were answered directly underneath for everyone to see in case you had the same questions. The quizzes are just being added and should all be there soon. The questions show up in a little bubble and they are multiple choice. The answers are shown at the end of the quiz, so you knew which ones your missed. I wanted my girls to go through this course because they are always taking pictures or short videos. Last year they videoed themselves acting out portions of their favorite movie. Delaney loves to speak other languages and she has written puppet shows all in Spanish and made her sisters act them out with her while I recorded them. Although they had a lot of fun, it would be nice if they were better quality and we could have sent them to the grandparents to enjoy. Their oldest sister loves to take pictures of landscape and wildlife. When she was still in our homeschool her electives always included photography, primarily books from the library. She just recently sold her first photographs to a dentist office. I know my kids hobbies can some day turn into more for them. While we watched the equipment lessons we got out our DSLR camera and our lenses to see exactly what Zach was telling us. We already have a couple of lenses and some filters that he suggests using, but we had never used the video feature on our DSLR. My neighbor has a photography studio at her house and we went over to look at the lighting equipment she uses after watching the lighting lessons. Although she only takes still pictures of people she had a lot of the items we learned about in the course. My girls are looking forward to watching the module on Sound, because they all play instruments and sing and will record themselves once in awhile to hear how their song sounds. We all went through the quiz together also. They remembered most of the answers right away, but there were a few they weren't sure on, but once they started discussing what Zach said they could remember most of them. We may not be creating feature films, but this course is helping all of us even in our daily lives. While we were at the beach recently my girls were taking pictures with their devices and the DSLR camera. They were noticing things about lighting that they had just learned in those lessons. My husband wanted Delaney (age 14) to take his and my picture in the sunset with the water behind us with his phone. She asked him if he realized that we would be very dark in the picture and she proceeded to tell him all about lighting and cameras. Ken and Zach Lawrence have been have been in the video production industry since 2004. This father and son have several productions including the feature films, DVD releases, TV series, documentaries, and short films. Ken is not only a certified Career Technical Education instructor in Audio/Video & film as well as a pastor, life coach, actor and Christian film producer. Zach has credentials working with the crew on various details. He wrote, produced, and directed the film In His Steps and produced the web series Indy Christian Review.